Order The New Portuguese Table on Amazon.com and Barnes & Noble. Nestled between the Atlantic Ocean and Spain, Portugal is today’s hot-spot vacation destination, and world travelers are enthralled by the unique yet familiar cuisine of this country. The New Portuguese Table takes you on a culinary journey into the soul of this fascinating nation and looks at its 11 surprisingly different historical regions, as well as the island of Madeira and the Azores, and their food culture, typical dishes, and wines. This book also showcases Portugal’s pantry of go-to ingredients, such as smoked sausages, peppers, cilantro, seafood, olive oil, garlic, beans, tomatoes, and bay leaves — all beloved by Americans and now combined in innovative ways. 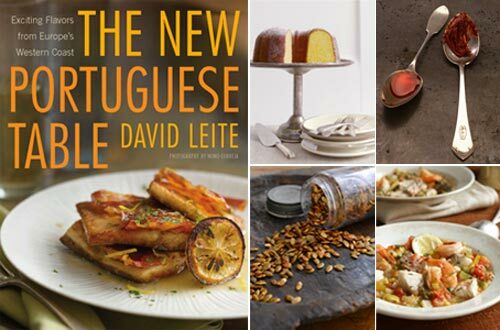 In The New Portuguese Table, David Leite provides a contemporary look at the flavorful food of this gastronomic region, sharing both the beloved classics he remembers from cooking at his grandmother’s side, such as Slowly Simmered White Beans and Sausage, as well as modern dishes defining the country today, like Olive Oil–Poached Fresh Cod with Roasted Tomato Sauce. With nearly 100 full-color photographs and a contemporary perspective, The New Portuguese Table is the handbook to the exciting cuisine of Portugal. This sauce is so lovely. The proportions of the sauce are perfect; it’s really a great combination of flavors. It comes together so quickly, then comes out so pretty! Perfect for any night of the week. I used rock cod and red peppers. The [saffron] taste remained delicate, yet was rich and pronounced. It was certainly delicious and dinner-party worthy. Definitely goes into the do-again list. Well, isn’t this the best quick shrimp dish ever! Having made the piri-piri sauce in advance (a couple weeks ago, as directed), I threw in the shrimp in the morning. They went on the grill for a few minutes before dinner, and there we had it! A salad tossed together and dinner was served. I did put a little bowl of piri-piri sauce out, but the shrimp had absorbed so much flavor, it wasn’t even touched. I started marinating the chicken breasts the night before, so they were in more than 24 hours. The taste was wonderful! With the long marinade, the chicken really absorbed the flavors. I have to say that this dish wasn’t what I imagined to be Portuguese flavors. We certainly see Portuguese influence in dishes from around the world, and it only makes sense that there would also be some cross-pollination. If there is anything that outshines the compelling smell of the amped-up red pepper paste as the tenderloin hits the skillet, it’s got to be the taste of the pork, with the sauce on the outside and the cheese on the inside. I served roasted carrots and turnips on the plate, and a green salad on the side. A complete winner for the senses and a worthwhile dinner party dish, to be sure. Creamy eggs with onions, garlic, asparagus, and fried potatoes, are placed atop the spears of asparagus and make a soft landing for the seared cod. I used the suggested herb oil from page 40, which consisted of a bouquet from the garden heated in Tuscan olive oil for 8 to 10 minutes. This was a very nice addition and I used more of the oil for roasting vegetables at dinner time. All in all, a lovely meal for brunch, or anytime. Why are these potatoes so creamy? Leite mentions the creamy texture in the intro to the recipe, but I wasn’t expecting anything different from a usual roasted potato. Does the salt on the skin do something? Anyway, I don’t know the answer, but I loved these potatoes and the technique. Just fantastic. Not completely 100% authentic but close enough and utterly delicious. The dough is a little fussy to prepare but well worth the effort. All reviews courtesy of members of Eat Your Books. Most of my knowledge of modern Portuguese cuisine comes from the episode of “No Reservations” when Anthony Bourdain went there. I can’t wait to see some teaser excerpts either here or on your Amazon page. I only saw one episode, and that’s where he took part in a pig slaughter, called a matança–very Old World. I’m not sure what else he’s covered. Hi David, just bought your book and should get it on Monday. [Tony Bourdain’s] “No Reservations” show was about the Azores and was fantastic. It starts in Fall River, Mass, where I live, which has the largest Azorean population outside of the Azores. My mother’s family is from there. We have the best Portuguese restaurants, markets, and bakeries of anywhere. Steve, I’ve seen the show (in fact, there’s a quote from Tony on the back of my book), and I was born in Fall River, so I know its riches. We borrowed the book at our local library. It was amazing, since we lived in Fall River, MA and found all our favorite foods. This is one book we will be buying this month. Thanks, David. I live in Portugal, where can i buy your book? Hello, Carla. I know that FNAC used to carry it, but I’m not sure anymore. My grandparents and mom and dad always did a matanca every year. Linguiça, blood sausage, head cheese…it was the best. A tradition that is no longer since they have all passed. It was a lot of work! Deb, sadly, that’s what I hear from a lot of people these days. Fewer and fewer families do a mantança. It’s becoming a lost tradition. Yes, David, you are correct. You have to raise a hog and have to know what you are doing. I was about 16 the last time my grandparents did a matança and that was 42 years ago! Sadly, they took that with them and we no longer have a need for that special tradition. Deb, I’ve never been to one (I’m kind of glad, I have to admit). But matanças maintained our family year after year, and for that I’m grateful. My partner and I have recently moved to Lisbon from California to live like true Lisboetas. Love the beautiful architecture, history, climate, and warm friendly people too.! We are both foodies having had restaurants in San Francisco and much experience consulting in the industry. Indeed, Mr. Bourdain brought a whole lot of positive attention to Portuguese food. That being said, the current culinary state of Portuguese cooking overall is for the most part sadly lacking in originality and flavor. Indeed at times poorly cooked and lacking proper basic culinary techniques and not at all like other Mediterranean cuisines. Actually, rather old style Germanic.The locals love their boiled potatoes and soggy veggies. It is really a surprise given all the fantastic and fresh seafood, meats, and produce that is to be found here. On a positive note, the inexpensive wine, cheese, and baked goods are fantastic! Gregory, say hello to the Portuguese Paradox. There’s a schism in the social and culinary spheres in the country. You have to keep in mind that Portugal was under the dictatorship of Salazar until mid-20th century. It affected an already poor country. I remember my father and our family telling stories of crushing poverty and lack of resources, such as electricity and telephone, that didn’t arrive until the late ’60s and early ’70s. My grandfather was regularly sending huge crates of clothing and supplies back to the Old County to help out. Without a lot to eat, there wasn’t much focus on cuisine. Only in the past 30 years or so has the country started healing, and only in the past 10 or so that chefs started to bring worldly flavors and techniques back to the country. But as Chef Fausto Airoldi said to me, the Portuguese will walk miles and miles for a traditional pot of boiled meats and potatoes instead of crossing the Avenida Infante Dom Heníque, which divides Lisbon from Bica do Sapato, the restaurant that catapulted him to prominence at the beginning of the century. It’s as much a physical divide as a metaphorical one. Where I discovered some exciting food and cooking was in the homes of some of the younger Lisboetas. Dinner parties there took on the feel of a salon, with someone playing piano, a writer reading her work, others vehemently arguing politics. But peace convenes when they sit at the table. Give it time–it took me a while to see beyond the obvious. The best thing is you there right now–in the beginning of a culinary revolution that happened here in the ’60s. Oh, one last thing: Portugal isn’t a Mediterranean country and doesn’t consider itself to be one. When it comes to food, its eyes, palate, and wallets have been fixed on the Atlantic for hundreds of years, the Age of Discovery notwithstanding. Congrats, David. Love the cover, the photos and style…can’t wait to get my hands on your new book. Hi, David, and congratulations on the book! It often takes foreigners like us to come in and shake up the status quo. Cortes de Cima did it for wine in Portugal, and you seem to be doing it with food! Do we really have to wait until August to get hold of it?! Hi Carrie. Yes, sadly we do have to wait until August for the book. But I hope it’s worth the wait! Cortes de Cima is mentioned in the book, as it produces some of the best wines coming out of Portugal. Ahh, well you should try Xisto! A Douro wine from Roquette e Cazes. That would be my top favorite! Pete, I have. I visited Tomás at his vineyard in the Douro, and he poured me some. It’s an amazing wine. It was crush time, so it was a bit cool, and we sat on his terrance overlooking the infinity pool and the hills and river beyond. It was exquisite. It’s here! It’s alive! It’s great! Congrats! Ola! Leite, we are just so proud of you! All of the 150,000 people in Hawaii who are Portuguese, just love Portuguese food. We wish the best. Mahalo! John, thank you so much for the kind words! I hope you enjoy the book. It’s got a lot of wonderful new and classic recipes in it. So beautiful I could eat the pages! Congratulations on a magnificent work that is user friendly even to the kitchen-shy. Thanks, Judith. It was lovely of you to comment. The book looks fantastic. Thank you, David. This is just the kind of book on Portuguese food that I’ve been waiting for. And it’s going to make next year’s Christmas so easy — the time I’ll save not having to shop for gifts for my sisters will give me the opportunity to try out a couple of recipes! Thanks, Mary Ann. That’s very kind of you. There’s a recipe in the book for roast turkey with two dressings–a bread-based one made with chouriço and a potato-based one made with pork that my family always served on Christmas. It’s wonderful. Plus lots of new, never-before-seen recipes, as well as many, many updated classics. Thank you David! It’s about time that looking at books for recipes, we will see the title with the word “Portuguese” emblazoned on the cover. It’s been too long in coming. I would like to see many more. Thanks, Ray. And I must say, the word Portuguese is big! I hope you like the book when it comes out. Stay tuned to the Portuguese section of LC. More info, recipes, and fun stuff will be added the closer we get to the publication date of Aug. 18th. Wonderful! I can’t wait until August. It will be an early birthday present for me. I have observed your website for some time, and I believe this book is the inevitable result. Congratulations and much success. May you spread the word about our tasty, nutritious, and underrated cuisine. Thanks for the well wishes. I hope you enjoy the book when it comes out. And check back on the site often, as more Portuguese content will be added over the next several months. David, I wish I could write as well as you so you could understand how beautiful I feel this book is. I can hardly wait to hold it and read it and cook from it! Maria, that’s so kind of you. I hope all your testing of the recipes was worth it now that you’ve seen the end result. Congratulations, David. This will be a cookbook treasure. Thanks, Blima. That’s might kind of you. Remind me to have your copy autographed! We are so excited about this book. Being from the Azores, we find it refreshing to see modern takes on classic Portuguese cuisine. Glad to hear from you! I’m looking forward to reading the articles and sharing them with others, after all we Portuguese must encourage and support each other. I find that’s the one thing that we don’t do enough of. However, I’m glad our generation is seeing this as an opportunity and our responsibility. I very happily and gladly accept this responsibility. We Portuguese citizens of which I’m honoured to be among, since I have dual citizenship as well, for I was born in Sao Miguel and migrated to Canada as a toddler, must continue to show our pride in our heritage and culture. Please feel free to keep in touch. Kudos! Echoing others who commented on your forthcoming bundle of joy, August seems a long way off–but at least there will be something to look forward to in August. Your creation will be a very welcome distraction from the increasingly stifling heat of southern California summertime. And, by the way, the photography samples above are gorgeous. Hi Judith, thanks for the kind thoughts. I look forward to hearing your comments when you see the book. I’m very pleased with the photography. Nuno Correia is from Lisbon and came to NYC for two weeks to shoot. Being Portuguese, he has a real understanding of the food, including the contemporary dishes, as he shoots a lot of them for magazines in Portugal and other countries. How incredibly gorgeous! You must be so excited. I’ve been following your writings about Portugal for years, and can’t wait for the book. By the way, I loved your piece on the Tentúgal pastries in the latest issue of Saveur. Carolyn, thank you. I look forward to your comments after you see the book. And if you ever get a chance to visit Tentúgal, stop by the bakery. Olga is lovely, and the pastries are delicious. So are the breads. And take the short drive to see the convent. I love its old, weather-beaten doors. Adeus, David! Surely the fabulous cover of your book is a gateway to great reading inside! I’m confident your Portuguese heritage will be reflected in the pages. Your gift of writing, woven into your Portuguese background, is incredible! I look forward to purchasing your book. It sounds like a best seller! I wish you well. Eliza, muito obrigado pela sua mensagem. There are a lot of recipes from my family, so my Portuguese heritage is definitely in there. Come back after you’ve seen the book and tell me what you think! I can’t wait! David, this book is absolutely gorgeous. 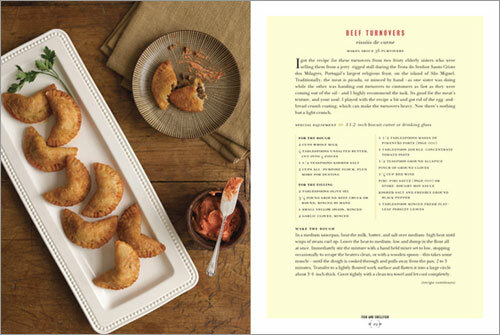 The photographs are beautiful and your text and recipes are thoughtfully researched and written. It was such a pleasure being a part of the testing process. Many of these recipes are now part of my regular routine. We especially like the Shrimp in Potato Jackets, your fabulous Maionaise de Leite and that wonderful Orange Cake. Your rice pudding is the rice pudding to end all rice puddings. I could go on and on and on… I’m counting down the days until August 18th. Ola David! Muitos parabens! I can’t wait to get my hands on your book. I’ve made many recipes from your Leite’s Culinaria site with great success. I’m sure the book will bring wonderful memories from home. Cara Isabel, muito obrigado. I do hope you like the book. It offers a lot of different recipes–many never before seen in this country. But there are the classics, too. I could never forget to include those. And, who know? You very well could be one of my cousins! Thanks, Sheilah. Did you get an advanced copy? I am so looking foward to reading and cooking from your book! Anamaria, thanks. I just saw the first advanced copy. It’s gorgeous. Uncle David, congratulations on your new book. Mom and I are going to buy it. Mom says to tell you she loves your chocolate chip cookies. Right now I’m trying to figure out how you made those great mashed potatoes and chives. It’s my turn to make dinner tonight. Maybe I’ll be as good of a cook as you someday. Call Me. Love You! Hi, Megan. Thanks for the nice words regarding the book. The potatoes are easy. Peel and boil about 4 pounds of potatoes until tender but still hold their shape. Drain them in a colander until cool enough to handle. Meanwhile mix 1 cup of mayo and some vinegar, salt, and pepper in a small bowl. Mince a big bunch of chives, adding about 1/2 to the mayo mixture. Pour the mayo over the potatoes and toss well. Scoop the salad into a bowl and sprinkle the rest of the chives on top. (In you need more mayo, just add some.) But remember: always taste as you go along. A sprinkle of salt, a few grindings of pepper, a drizzle more of vinegar can make all the difference. Love you, too. David – Thanks for the reply as my order has been placed and I’m excited especially for the potato recipes! Now if I could only bring back a sufficient amount of good Portuguese olive oil to the States from Lisbon every few months, I would be set! Sadly, there is a dearth of Portuguese culinary products in the greater Chicago area (olive oil, wine, and cheese). Boa Sorte! I honestly have never had Portugese food but LOVE to cook. I am very much looking forward to your book and am anxious to open myself up to new discovery!!! Congratulations, David! It’s so gratifying to see all your hard work culminate in some well-earned recognition. I just got a copy today, and it’s a beautiful book. I’ve already earmarked a half dozen recipes to try, starting with that Lemon-Mint Chicken Soup. Thanks, Renee. Finally, huh? I glad you like it, and I hope you’ll be making massa sovada for that husband of yours. Let me know if you have any questions. You can ask them in the new section Ask David. David, As a fellow Fall Riverite I’m excited about your book. My brother is a private chef on a yacht, and he and I both spoke about purchasing several copies as gifts for friends and family. Congrats. Derrick, thanks. I hope you enjoy it. I think by now all the major stores in the area are carrying it. Hi, David, Great book, congratulations! My husband (of Ukrainian background) I LOVE Portuguese food. I’m planning on buying your book (got it from the library for now). I read your profile by Mark Rotella in Publishers Weekly. Please tell us what Portuguese restaurant in the Ironbound you went to with Rotella. The menu sounds great. We want to go tomorrow. Thanks. Oksana, the restaurant is Seabra’s Marisqueira at 87 Madison St, Newark, NJ 07105. It’s a great place. I prefer to sit in front at one of the tables in the window. Suggestion: Bring the book and have it on the table. I’ve sent so many people their way that they always do something a little extra for my readers. And, whatever you do, don’t miss out on the açorda de marisco. David, thank you so much for your recommendation and for your prompt reply! I was looking all over the Internet for this information. We are celebrating our daughter’s going away to college—and this will be a great treat! Thanks! Thank you for writing this book. David, your book arrived and I couldn’t wait to begin cooking. So, tonight I outdid myself with the chicken on page 110! Caramba, que coisa maravilhosa! That sauce you use (“Amped-up Red Pepper Paste”, page 232) is so delicious I couldn’t help by eat a spoonful (well, two…) straight out of the blender! About the “piri-piri” sauce that’s required: that may be hard to find in some places in America, but I found it where I live (Santa Fe in New Mexico) at “The Spanish Table”, along with that beautiful copper cataplana, which gives me a very good reason to try your recipe on page 92! Thanks, David! Lina, my pleasure. I’m so thrilled you’ve already enjoyed so many recipes. The Amped-Up Red Pepper Paste is pretty awesome. It’s also an important part of the pork and clams dish, one of my favorite recipes in the book. Write me when you’ve cooked more. It’s here! It’s arrived!! Am holding your book in my hot little hands in my office in Singapore, and am thrilled to bits. QUE BELEZA, David – the recipes are making me drool and the photos are fabulous! Thank you so much for making this happen! Ling, So glad you finally got the book, and you like it. The photographer, Nuno Correia, is a genius. He came all the way from Lisbon to shoot. Let me know how you enjoy the recipes. I saw the librarian putting your cookbook on the new shelf, and it caught my eye right away. I got it out and then at home nestled on the couch to read it. I was delighted to find that you’re also from Fall River, and that your Vo-Vo came from Saint Michael [São Miguel] about the same time mine did. My Vo-Vo is no longer with us, but I’ll never forget as a child making sweet bread with her. Why is it that in the middle of the night, she said, “It’s time to make the bread.”? She didn’t speak much English, and I didn’t speak much Portuguese (moved to Philadelphia when I was 4), but we communicated through the food that she made. There was always enough for an army, and on Sundays it felt like one when the family stopped by. I’m really looking forward to making many of the recipes in the book, since most of her cooking was done from memory. Debra, I’m happy you snatched the book before anyone else could. You probably were the first to check it out of the library. Like yours, my grandmother didn’t speak English well, and I didn’t speak Portuguese much, so we had our own language: Portglish. And we, too, communicated through food. It’s amazing how much love we conveyed without saying a lot. Ok, David, I loved the book and just bought it from Amazon. This past week there was a nice article on your book in the Philadelphia Inquirer Newspaper. I clipped it out and will keep it with the book when it arrives. I forgot to mention before when I told you about my being originally from Fall River. Every summer when I go up there I ate my way through the city. The Liberal club, Saint Michael’s, and Ogil’s. I can’t think of their names of the others, but a good one was near Chaves Market on Columbia Street. Any recomendations? Debbie, I have to get back to you on that. When I go to Fall River/Swansea, I eat at home every day. I’m hungry for comida da minha mãe, so I don’t get to restaurants. I’ll be up there in mid-October for an event. I can certainly look for you. I wish I could still eat at my VoVo’s, but now, it’s my turn to cook! Thanks. Was just at Chaves [market], the two restaurants near there are: Sagres and Cinderilla’s. Olá David, I just received my birthday present of an autographed copy of The New Portuguese Table. It is beautiful! I love the photos and stories that go with the recipes. It is really a work of art. Your writing style is so fun and at the same time the work you put into this is very evident. Its beautiful. Parabens! Thanks, Cherie. So glad you like it. And happy birthday! I just moved to the Azores last year (from the States), and I’m SO excited to have your cookbook! (I just received it as an early, early Christmas present). I love cooking, but the other Portuguese cookbooks I have are kind of old-fashioned and daunting, in a way. I just read through yours and bookmarked so many of the recipes I want to try, and I have great access to all of the ingredients! My local grocery store and outdoor market have a ton of presunto, chourico and linguica, bacalhau, good olive oil, fresh favas (in season), etc. Yay! So glad you got the book—and that you can get so many wonderful ingredients nearby. You must write me and tell me how you liked some of the recipes. Just got the last copy at the local B&N on Thursday and spent the rest of the day “in the pages” just imagining future meals! Congratulations on a beautiful work full of great pictures, great commentary, and certainly great inspirations! Thank you, thank you, thank you! I am Azorean (from Terceira) and live in Hawaii. A friend just gave me The New Portuguese Table. I love it. Beautiful pictures and recipes. Feliz Natal e Prospero Ano Novo. Felicidades. Hello, Fátima. So glad you like the book. I hope you have many years of happy cooking with it. Feliz Natal e Prospero Ano Novo, também! Hello David. I found a link to your book in all places Men’s Health (Dec 2009) and I will be looking to buy a copy of your book. I am Azorean (from Terceira) and love Portuguese cooking. I have about 12 Portuguese cookbooks and I will be adding this one to the collection. Americans should know how simple and wonderful Portuguese cuisine is and tasty. How about a special on the FOOD NETWORK! Ana, now you’re talking! All you and about 6 million other people have to do is storm the offices of Food Network and demand to see me on TV. I wish Portuguese food were higher on their list, but perhaps someday. In the meantime, I’ve done a lot of local TV, national radio, and will be on a national talk show this spring. Boo-yah! Great book, David! I’m really enjoying cooking from it—reviewed it on my site. Hi David, I just read an article about you and a couple of your recipes on the Weight Watchers site. (I’m a member.) I was sooo pleased and excited to see that. We were very lucky to grow up in a very small farming community out here in California filled with Portugese people, where most of us lived on dairy farms. The food our moms, tias and avos made was fabulous. Now that most of them are gone, it’s so important to me to keep those traditional foods going, especially for my children and grandchildren. Your book is going to help do that. I know what everyone is going to get for Christmas gifts this year. :) Thank you. Victoria, thank you for your kind words. I agree we need to keep our traditions alive and well. And we need to pass on to the next generation a love for Portuguese food and, equally important, a love of cooking. They go hand in hand. I’m glad my book will help your family do that. Please don’t hesitate to contact me if you have any questions. We just finished eating the roast chicken. Pictures will be posted probably tomorrow. I bought your book and got it delivered yesterday, I had to read it in one go… now I must put in practice some receipts. I am Portuguese born and raised, from Tras-os-Montes. Although some of the receipts that you present are not truly traditional, I loved it. I also enjoyed the stories, the regional details, the wine makers list and how you make the most of tradition in a contemporary cooking book. Surely, you made me proud of my country. Congratulations on the new book. The recipes and descriptions bring back many memories from my youth growing up in Taunton, Mass (another great Portuguese settlement). I was wondering if you are familiar with a meal my Madeiran Grandparents used to prepare for Christmas Day. It was a marinated pork dish. The pork was cut into small bite sized pieces. They would also put sliced Portuguese rolls on top of the pork just before it finished cooking, which would soak up some of the fabulous tastes from the pork and marinade. Hello, Rich, thanks for the kind words. Taunton, RI, is not too far from Fall River, MA, where I grew up. The dish you’re remember is carne com vinha d’alhos. It’s pork pieces marinated then cooked in a wine-garlic sauce and served on rolls. Here’s an article on the dish: Carne com Vinha d’Alhos. My friend, Laura, and I, have a Quarterly Cooking Adventure where we cook things we want to learn more about. This time it was my choice, and I chose recipes from your book. I lived in Lisbon many years ago, and have fond memories of the food. Your recipes are a revelation – such wonderful twists on traditional ingredients. We made the Peixinhos da Horta (served with both the Maionese de cilantro e gengibre and the Massa de pimentao forte) accompanied by vinho verde Gazela; Rizoto de Azeitonas Pretas, accompanied by a red Dolcetto D’Alba; and Mexilhoes de Caril over rice, using a Zanzibar curry from Savory, accompanied by a white Alento wine. Desserts were the Biscoitos de limao e azeitonas pretas with vanilla ice cream, and the Mousse de chocolate with the pink peppercorns and Portuguese flor de sal (also from Savory). What delicious food!! I will be cooking from this book over and over. Thank you so much for all the time you put into creating it! I really love all the pictures at the beginning! I can’t wait to try the bread recipe. It looks so cute when it’s finished. I am definitely going to make this asap. YUM. 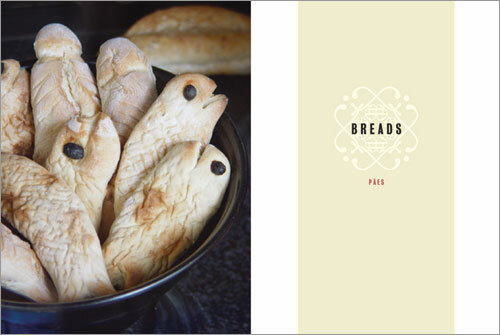 I must have this cookbook. My grandparents on my fathers side were both fron Flores in the Azores. My older sister was lucky enough to have her wonderful children take her on a trip there this summer. The pictures made my homesick for a place I have never been. Maybe this book will fill some of that void I’m feeling for that beautiful place. I am so excited to learn about your cookbook! I’m an Indian-American woman who is married to an Azorean-Cape Verdean (who grew up in Sao Miguel). We live in Paris and both love to cook. I’m interested in learning more about Portuguese cuisine and culinary history, so I can’t wait to order your book. Thank you for your very kind words. I hope you enjoy the book. In it are several recipes from my family, which is from São Miguel. Ah, Paris. Was there on my birthday. We’ve made a commitment to go back one a year. WE just love it there. Picked up your book in NY on my way back to Portugal. As a fellow American living in Lisboa (Graça to be exact), where exactly is this bakery for the magical orange-olive oil cake? Olá, Nicholas. The recipe is adapted from a cake that I had at a tiny, tiny resto call Pappas. It’s just up the street from the Sé Catherdral. When I visited last, after I moved from Lisbon, they were no longer serving it. Steve, first congratulations on winning the book. It’s one of our most popular giveaways. Second, I’m so happy you like the book. I hope you enjoy it and find many recipe to make again and again. If you want suggestions, just let me know! Hi David, I love the book and the recipes in it. I attended your presentation at Boston University last night and LOVED every minute of it. I love seeing Portugese people in the media, writing books, acting, singing. I feel that Portugal is a country that doesn’t get enough credit. Lidia, so glad you enjoyed the presentation. The culinary students did I great job, and I enjoyed working with them. And I agree that Portugal and Portuguese people don’t get the exposure they deserve. But that’s slowly changing. I rec’d The New Portuguese Table as a Christmas gift, an autographed copy I might add. I’ve been reading it over the past two days and am fascinated. Like you, I never really embraced Portuguese foods until later in life. My wife is Polish, and we celebrate many of her traditions, but now we’re sharing both cultures. Tom, thanks for writing. I hope you enjoy the book, and find many of your childhood–um, favorites–in there. MichaelB, I hope you enjoy it. if you have any questions, don’t hesitate to ask. My mom just gave me a copy of your book and I love it. The mix of recipes are wonderful and the photos really whet the appetite. Now I just have to get cooking. Congratulations on a fantastic book. Pedro, what a nice thing to say, thank you. If you have any questions, please let me know! Hello David, my name is Nuno and im a big fan of this book, being an aspiring proud Portugese chef. I was born in Soajo, which is up North near Spain, so i loved seeing the Mihno in the book. Thank you for a great book. P.S. great pictured but Nuno Correia. Just wanted to say that I was born in Santa Maria, Azores, and raised in Fall River as well. Though I now live in western Mass., I appreciate knowing that you, a fellow Portuguese cookbook author was raised the same way I was. My own family is from São Miguel, and let me tell you how excited my U.S.-born husband and I were to find your book with the great recipes I have made over the years, and are beginning to make some new ones you feature. We’ve visited both the Azores and Lisbon twice recently, and we’ve enjoyed your comments and wonderful stories in the front of your book, where it took us back and reminisced. Would like to know if you’re involved in any events in the Western/Central Mass. area. Cheers to you and yours! Maria, thanks for your kind words. I’m so happy the book is useful to you and it served to reawaken memories from your recent trips. I’m not involved in any events in Western Mass, but I certainly wouldn’t rule it out! We visit often, as we have a home in Western Connecticut. We love it up there. Thank you for a great night, a fun party, and the wonderful recipes. By the way how did I cook without that Amped Up Red Pepper Sauce? Leah, how wonderful. I’m so happy you enjoyed the food–especially the Amped-Up Red Pepper Paste. Oh, and your husband is spot on. When I was working on the book, if the house didn’t smell like my family’s then I knew something was wrong. I just got my book from Amazon! I debated for a long time whether I needed another cookbook (!) and even took it out of my cart…and then put it back in!! So HAPPY I did!!! I love that your recipe for Olive Oil Orange Cake is in the book! I made it many times, including once for my mom and dad and Mom said it was just like hers she used to make! I can’t wait to make them the “Russian” Nut Cakes! Looking forward to the Lemon and Olive cookies and the fried cornbread as well! Mmmmm…getting hungry just talking about it all! David, I am also interested in becoming a Portuguese citizen. My parents emigrated with my older sister but I was born here (in Canada) shortly afterwards. Would you be willing to share the process that it took for you to get there? I would greatly appreciate it. Chef David, Thank you so much for such a great resource! We host a private dinner club in Ohio and frequently showcase Spanish and Portuguese cuisine, since this is what I grew up on. I’m from a Portuguese family originally from California and having actual recipes as opposed to guessing is such a God-send! I made your pine-nut cookies recently for a tapas night we hosted and they are a new favorite! Thank you so much! C.
Carrie, first I’m not a chef, nor do I play one on TV. I’m merely a food writer and author. That being said, if I had a toque, it’d be tilted at a rakish angle! Thank you for the kind words about the pine-nut cookies. I love them, too. A real treat that reminds me of a cookie I had in the Alentejo, on my way to a sunset concert at the winery Cortes de Cima. Hello, Gary. First, Happy Father’s Day! I hope you get much pleasure from reading the book. To answer your questions: The inside cover art is a photo taken of the tile inside the chapel at the University of Coimbra. (You can see the color version on page 95.) The shot of the tree is one I took on the north side of São Miguel; that’s Maia, my father’s hometown, in the distance. Gregory, that is very kind of you. I wish you great success with your travel agency. Hi, just reading your blog. I just came back from a 3 week vacation in San Miguel Açores. My husband was born there and moved to Providence, RI, at the age of 9. You mentioned Maia. That is where we stayed for the three weeks at my sister-in-law’s home in the Maia. I love that town. Everyone is so friendly. My husband was born in Lomba da Maia, but his grandmother and sister live in Maia. I’m going to order your cookbook and can’t wait to get my hands on it. Hi Lori, welcome back. Yes, Maia is where my father’s family hails. They lived on Rua dos Foros, just down from the small school on Travessa de Rua dos Foros. I hope you enjoy the book. And if you have any questions, you know where to find me! One of the best memories of my trip this past August occurred in Faro. Well….I made multiple rounds navigating left & right, then left again on those worn, white cobblestone streets past a coffee-shop, a church, and a square…again & again. I eventually learned that Tasca do Ricky is closed on Sunday, but I had a fabulous tuna sandwich that was carefully crafted by hand…down to the bread and all the toppings being freshly sliced. When I return to the Algarve I will revisit Faro on a weekday and check out TDR. It seemed like a small city that had some offerings overlooked by many. Ruthie, Faro is a lovely small city, eight there on the sea. It’s a bit touristy, but as you quickly discovered, you can get lost (literally and figuratively) in it’s charm. I definetely encourange you to check it out hwen you return, and also hop over to Tavira. It too is a lovely small city. 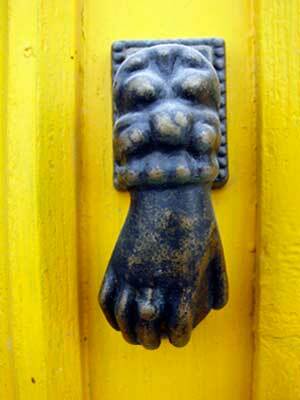 And while you’re there, look for the amazing door knockers they have. Does each recipe have a picture? A wonderful book, David – thank you so very much! Just finished reading through the book. I can’t wait to start cooking! Thanks for putting all of these great recipes together. My parents are from the Bairrada section of Portugal where food seems to always be a focal point. When I was growing up, my mom was always in the kitchen and I learned a lot from her. I cook everyday for my family…and usually something Portuguese. Parabéns AND Obrigado! Michael, thank you for your kind words. It was a honor to write the book, and it’s a pleasure to see so many folks of Portuguese heritage enjoying the book. Muito obrigado! Please share some delicious healthy food recipes for my 18 months old baby. Now he is interested to have varieties of food. italian food recipes, not being a father, nor having been around 18-month-olds, I really don’t know what kind of food they can eat. But if you pick up a copy of the book–at the store or library–you can make far better and appropriate choice than I. Now…if you’re looking for ideas for cats, I got you covered! Paulo, what’s the difference between alfacinhas and Lisboetas? I’ve heard–and have used–both terms. Olá, found your blog just now. Loving it! Lisboeta is a person that lives in Lisboa, like New Yorkers from New York, Portuenses from Porto. Alfacinha means small lettuce and is a nickname, as in tripeiro, for the Porto people. There are many possible explanations for that nickname. Ilídio, thank you for the clarification! Your book looks wonderful!! I was wondering if I might tap into your Portuguese expertise. I recently visited my aunt and her new husband, who is from Portugal, made us an amazing chicken noodle soup. The noodles were like orzo but he said they were Portuguese noodles. He commented that they were his last bag and I was hoping to send him some as a thank you for having us, however, I have had no luck identifying the noodle and have therefore been unable to find them. Any thoughts? Susan, I’m at a loss. I know my family, and a lot of Portuguese families, use orzo. So I don’t know if your new uncle has an imported version of that from Portugal. Perhaps one of our readers does? Try this. It’s the most common type we use for the chicken soup. It’s called Pevide. Bruno, thank you for this! David! Hello from Toronto, Canada. I bought your book last year and have tried a few recipes. I don’t consider myself a very good cook but your instructions are very helpful and I look/feel like a superstar in the kitchen now! The duck risotto was a big hit as was the rosemary custard. I have made the frango na pucara twice now and it is so delicious. Thank you for sharing all of your wonderful and delicious recipes. Monica, you’re my official New Best Friend of the Day! I’m thrilled you like the book and find it instructive. When you make more dishes, take a few pix and send them along. I always love seeing what my readers create in their kitchens. Hello, I was looking for a pata negra paella pan, stumbled into a copper cataplana. Purchased a vintage one from EBAY, supposedly from W Sonoma, but had to return it as the size was inaccurately advertised as being 9 inch instead of 11. In addition, one of the side clamps did not even clamp properly, being inches away from the cataplana when closed. So, I googled, found one last one at W S. Went there, was an 11.8 inch one, much lighter than the vintage 9 inch one, with the same defective clamp. It was labeled as “DAVY’ So, decided to buy one directly buying from Portugal after googling and innumerable email exchanges. They claim they make the best cataplanas, have the flat bottom versus traditional ones, which of course makes cooking on top of a French cast-iron cooktop easier as well as the gourmet bulging series. Well, the cataplana arrived, was very disappointed that both clamps when closed, did not even touch the vessel. In addition, it was difficult to align the 2 clam shells to close the clamps. Their explanation is that the cataplanas are not meant to be a pressure cooker, not a perfect seal, that if I want to have the clamps tightened, I had to adjust it myself. They also explained that they are the premium company in Portugal and probably manufactured the one I saw at WS since a lot of companies buy their wares and place their own logo on it! Return Policy is non existent unless it is damaged. Now, I am at a complete lost as to whether it is worthwhile for me to look for another cataplana after these incidents. Is it a fact that cataplanas are not meant to be hermetically sealed? I wonder if the older vintage metalutil which currently out of production are made the same? I did read a blog whereby the author stated not to buy any cataplanas unless they are handmade. Very disappointed, am not sure it is worthwhile at this point to pursue buying a vintage one if the comment from the factory in Portugal is accurate. I hope u can explain if this is true or poor workmanship. cristina, I, too, have experienced the same thing. My copper cataplana is somewhat flimsy and more of a decorative serving dish, than anything else. Cataplanas are not supposed to work like a pressure cooker and do not have hermetic seals. The brand that I use and like very, very much is Silampos. It’s a stainless steel model with a thick flat bottom. The clamps close but doesn’t make seal. I’m not sure where you can buy them here. I had them shipped to me special for a television event.